- Closed dollar volume of $1.2 Billion. January 2017 set records when compared to prior January home transactions. 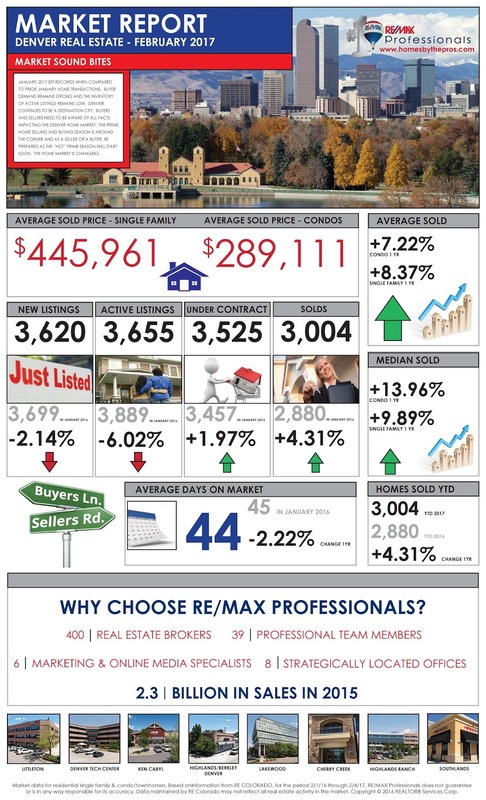 Buyer demand remains strong and the inventory of active listings remains low. Denver continues to be a destination city. 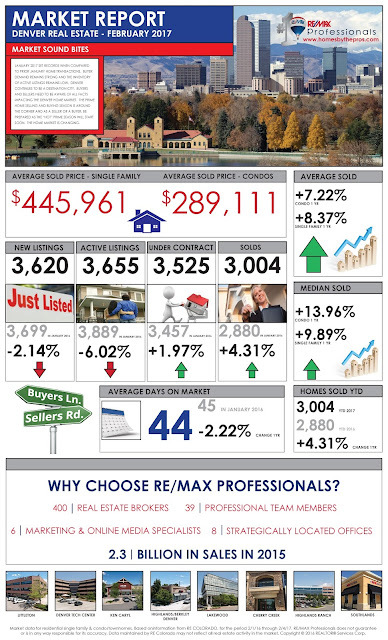 Buyers and Sellers need to be aware of all facts impacting the Denver home market. The prime home selling and buying season is around the corner and as a Seller or a Buyer, be prepared as the “hot” prime season will start soon. The home market is changing. Recognizing that “Housing Forecasts” predict a healthy real estate market for 2017, Seller’s need to be aware that the housing market is forecasted to be a Seller’s market due to strong Buyer demand, relatively low inventory of homes for sale, and reasonable price appreciation. With this being said, here are some top tips for 2017 Seller’s. List your home during the prime home selling and home buying season which is just around the corner. Strong Buyer demand will benefit Sellers. Second, price your home to the market. Be very aware of recent pricing for homes sold in or near your neighborhood or are a similar home to yours. Third, consider what you as a Seller needs to do to your home or if you may need to offer incentives to make the home more marketable. Denver will see more Buyers from all over the world. Denver will continue to be in the top five home markets in 2017. Consumers will continue to focus on home ownership. Seller preparation includes a good pricing comparison analysis, instructions on staging, what are the top improvements and a conversation on how the market functions. As such, the homeowner looking to sell a home needs a professional who is a local expert, market knowledgeable and can assist in the Professional plan to sell one’s home. Now is the time to reach out to a Professional as the real estate market is localized and very dynamic. Don’t take your chances that a lower cost option will save money and yield similar results as it often doesn’t. The 2017 housing market is forecasted to be primarily a Seller’s market mainly due to high Buyer demand and low inventory of homes for sale. The prime home selling and buying season is just around the corner and expect another market frenzy year. As a Buyer, be the early bird and get into the home market now, do your homework and be approved for the best mortgage option for you, consider buying a new home that meets your expectations, and look at the entire home market. Be aware of moderate home price growth and potential increase in mortgage interest rates. Create your home buying plan and stick to it.